The last ruler of the Shang dynasty (16th - 11th century BC) was a tyrannical and debauched slave owner who spent his days carousing with his favorite concubine Daji and mercilessly executing or punishing upright officials and all others who objected to his ways. Jiang Shang had once served the Shang king and had come to hate him with all his heart. He was an expert in military affairs and hoped that someday someone would call on him to help overthrow the king. 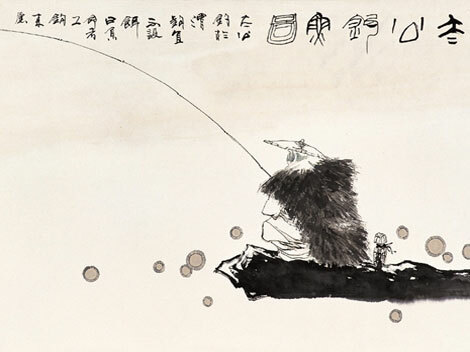 He waited and waited till he was 80 years old, continuing placidly with his fishing in a tributary of the Weihe River (near today’s Xi'an) using a barbless hook or even no hook at all, on the theory that the fish would come to him of their own volition when they were ready. 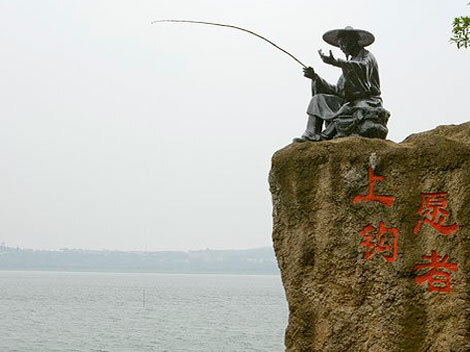 King Wen of the Zhou state, (central Shaanxi), found Jiang Shang fishing. King Wen, following the advice of his father and grandfather before him, was in search of talented people. In fact, he had been told by his grandfather, the Grand Duke of Zhou, that one day a sage would appear to help rule the Zhou state. When King Wen saw Jiang Shang, at first sight he felt that he was an unusual old man, and began to converse with him. He discovered that this white-haired fisherman was actually an astute political thinker and military strategist. This, he felt, must be the man his grandfather was waiting for. He took Jiang Shang in his coach to the court and appointed him prime minister and gave him the title Jiang Taigongwang (Hope of the Duke of Zhou). This was later shortened to Jiang Taigong. An account of Jiang Taigong's life written long after his time says he held that a country could become powerful only when the people prospered. If the officials enriched themselves while the people remained poor, the ruler would not last long. The major principle in ruling a country should be to love the people; and to love the people meant to reduce taxes labor. By following these ideas, King Wen is said to have made the Zhou state proper very rapidly. After King Wen died, his son King Wu, who inherited the throne, decided to send troops to overthrow the King of Shang. But Jiang Taigong stopped him, saying: "While I was fishing at Panxi, I realized one truth- if you want to succeed you needs to be patient. We must wait for the appropriate opportunity to eliminate the King of Shang". Soon it was reported that the people of Shang were so oppressed that no one dared speak. King Wu and Jiang Taigong decided this was the time to attack, for the people had lost faith in the ruler. A bloody battle was fought at Muye (35 kilometers from the Shang capital Yin, now Anyang in Henan province). Jiang Taigong charged at the head of the troops, beat the battle drums and then with 100 of his men drew the Shang troops to the southwest. King Wu's troops moved quickly and surrounded the capital. The Shang King had sent relatively untrained slaves to fight. This, plus the fact that many surrendered or revolted, enabled Zhou to take the capital. The Shang King set fire to his palace and perished in it, and King Wu and his successors as the Zhou dynasty established rule over all of China. As for Daji, one version has it that she was captured and executed, another that she took her own life. Jiang Taigong was made duke of the State of Qi (today’s Shandong province), which thrived with better communications and exploitation of its fish and salt resources under him. Understanding sleep phases can help those who aren't 'morning people' to rise more gracefully and shine brighter in the early hours.